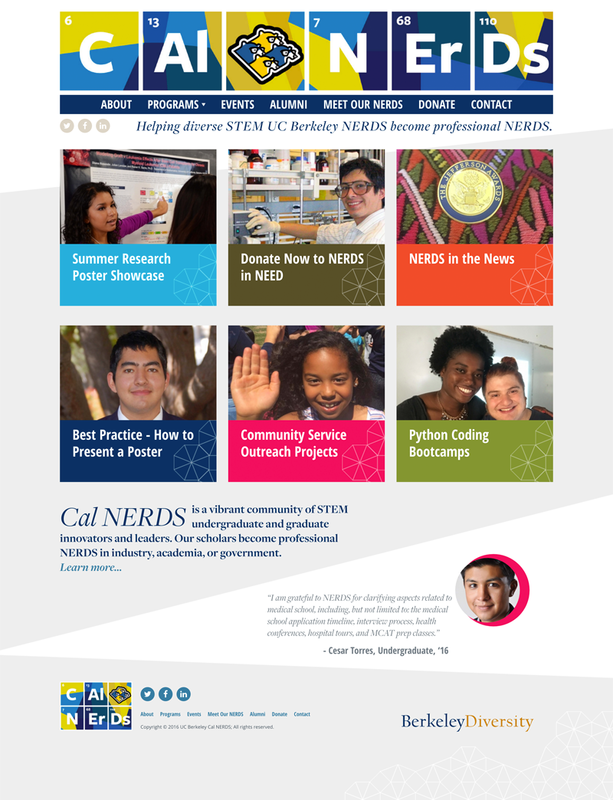 We’re always excited to work with universities, and today we’re pleased as punch to announce the re-launch of the website of a very special UC Berkeley program: Cal NERDs. The Cal NERDs program brings together science, technology, engineering and mathematics (STEM) undergraduate and graduate students. While in the program, this diverse group of students can participate in a large number of programs, research opportunities, and receive advice and coaching. Many go on to exciting profession and academic careers thanks in part to the assistance and support they receive as a Cal NERD. Cal NERDs is led by Diana Lizarraga, who reached out to Hop Studios after seeing our work on the Greater Good Magazine, another Berkeley project. Diana had two other key priorities in mind as well: the need for the site to display responsively across desktop, tablet and phone browsers; and accessibility support for disabled site visitors. After talking with Diana about her updating needs and getting an understanding of her busy schedule, it was clear that what was most necessary was a site that could flex with the program throughout the school year. We limited the number of static content areas on the home page in favor of a series of easy-to-update boxes that can be used to highlight anything on the site, from students to awards to upcoming events. Some neat customization features allow Diana to pick the color, graphic treatment, and pair them with photographs of the NERDs and their projects. The resulting design is vibrant, modern and professional, and highlights the student-designed Cal NERDs logo. Visitors using screen readers will find some features intended to make browsing the site a little easier: jump links make it easy to get to the page content; CSS styles can be turned off without also losing site readability; and the site can be navigated effectively using the tab key or other non-mouse input device.